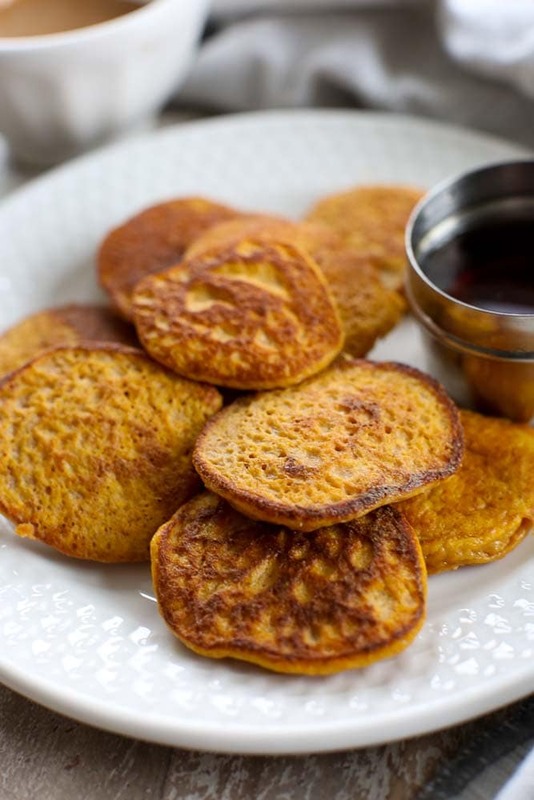 These 2-ingredient Sweet Potato Pancakes are Paleo, dairy-free, gluten-free, and always a hit! Note: This recipe was originally published in 2013. I am republishing with updated photos, a video, and a few tips and tricks to make this flourless pancake recipe! I’m kind of in love with this recipe. As a mom, you really can’t get any better than 2 ingredients. From a health standpoint, 2 ingredients means this is clean eating at its best. Pancakes with no processed flour that my kids love? YES. From a convenience standpoint, well, 2-ingredient recipes are a dream. 2-ingredient recipes that the kids like? Yes, I’m in love. Without the optional seasonings, these are very bland. The sweet potato takes to being seasoned very well, though, and there’s so many directions you could take these. Add some curry and salt and pepper for a more savory version. Sweeten them up to almost dessert status with a little sucanat or coconut sugar and vanilla extract. We love to add cinnamon and/or pumpkin pie spices. So good! 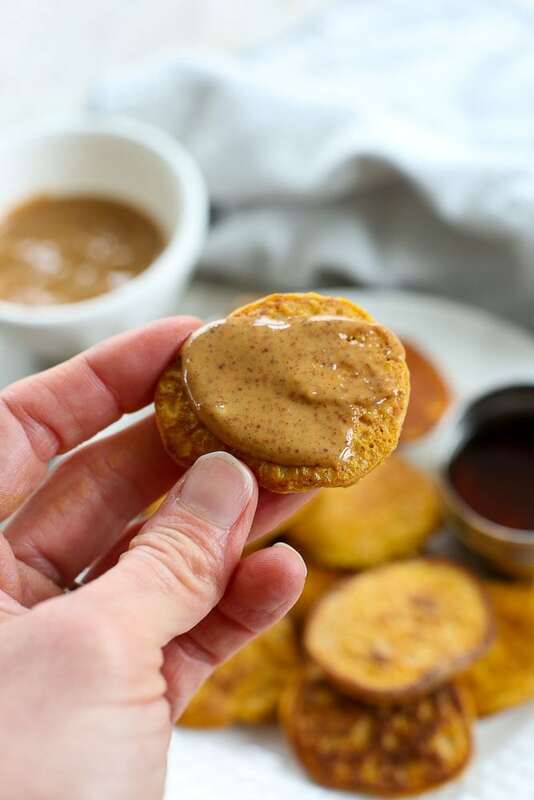 They are fabulous dipped in maple syrup or spread with nut butter. Whichever direction to take them, these little cakes are sure to be a hit with the whole family. Feel free to double or triple the recipe as needed. As written, it will serve 1-2. I typically make these as small, mini pancakes because it’s much easier to flip them that way. I have made them successfully as bigger pancakes, though, you just have to be careful when flipping. 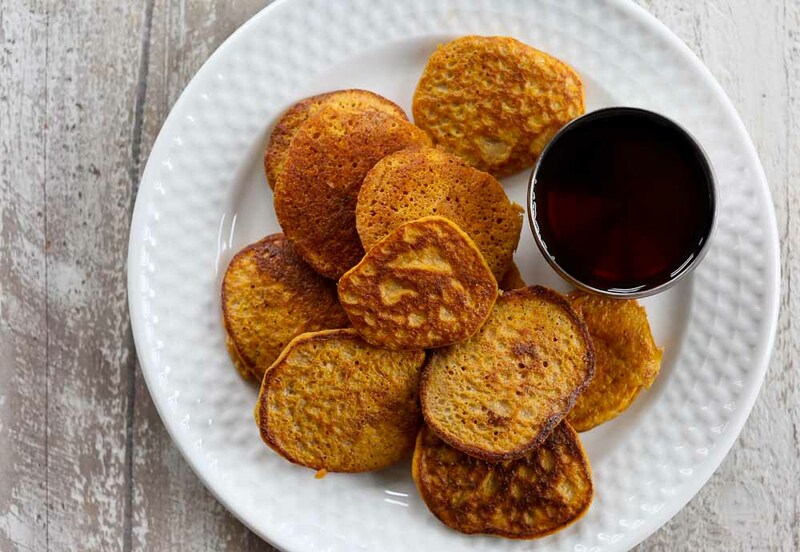 Over the years, I’ve gotten a lot of comments on these 2-ingredient Sweet Potato Pancakes. Here are a few tips for making these work well. Remember, they are flourless pancakes, so they are a little more finicky than regular pancakes. But they have been a family favorite for years now, so I know this recipe is solid if you follow these tips! Measure the sweet potato! This is crucial. You need 1/2 cup cooked sweet potato flesh and 2 eggs. You can double or triple the recipe, just keep the ratios the same. Do not flip until they are fully cooked on one side. One commenter said she’s timed it and she has found they need exactly 3 minutes per side. If you try to flip them too early, they will likely fall apart. Don’t try to cook these on too high of heat. If you do, they will likely burn on the outside before the inside is cooked. Smaller pancakes flip easiest. I use a tablespoon. Larger pancakes work, you just have to be patient and let them slowly cook, at a lower heat, a bit longer. You can mix the batter by hand, or use a blender. I do it both ways. Using my Vitamix makes a super smooth batter. 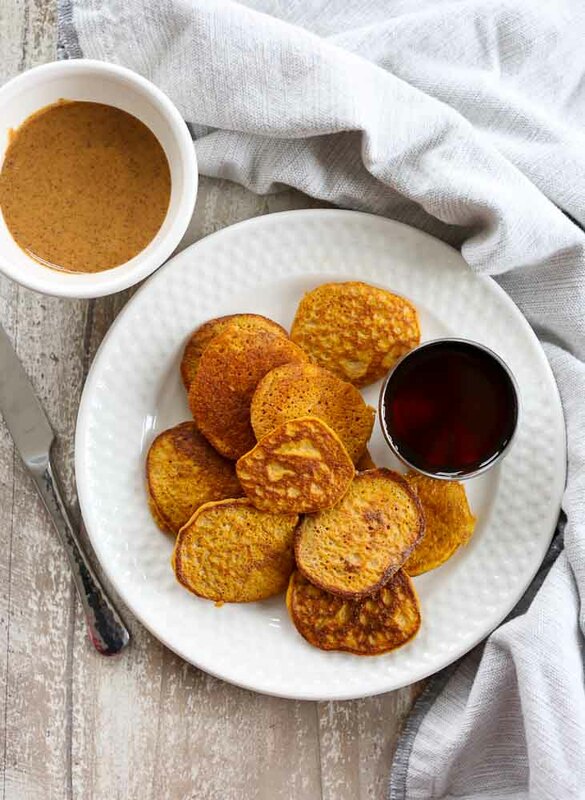 Check out the video to see how to make the 2-ingredient Sweet Potato Pancakes! Note: After a reader commented that she did this, I started to mix the sweet potato flesh and egg in my Vitamix Blender. It makes a smooth batter and the whole process even easier. Genius! Before I get to the recipe, I want to let you know about something that could be a HUGE game changer in your life! 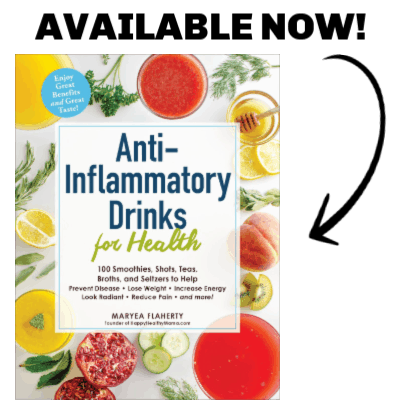 Are you trying to live a healthy life, but need some guidance? I want to help you! Download my Healthy Living Playbook, which is a road map to healthy living. It’s a how-to and motivational guide all wrapped into one, and it’s FREE! Get your copy by clicking on the image below! Flip each cake and cook for an additional 3-5 minutes, until lightly golden brown on the outside and cooked through. Note: I make very small cakes, using only a tablespoon of batter. They will need to cook longer if you make bigger pancakes. Lower heat works better, and don’t try to flip them before totally cooked on one side. Please note that links to products are affiliate links. Thank you for supporting my site! Ooohhh, I’m intrigued. My older son has decided he hates sweet potatoes and he can pick them out in any recipe. I wonder if he’d like these? Gonna have to try. If not, the baby and I will eat them! Are these pancakes freeze able? I’m totally in love with this recipe! Allan will have to wait a few more months before he can taste them but I’m convinced that Vera will love them. Two winning recipes in a row, thank you! Do you by chance know how many calories? Both eggs togheter have about 150 (depends on their size) and a sweet potato goes with 84 per 100g. Just have to put that togheter. For 100g of the ready pancakes you just have to weigh all and divide the kalories for the whole lot through it and that × 100. I’m so glad you commented. 🙂 Thank you, Tonja. I love the idea of using butternut squash; I actually have one right now that I wasn’t sure what I was going to use it for. I’m definitely going to use some of it to try this with it. I cannot wait to make these for my picky toddler! He went from loving all things fruit & veggies to hating 99% – can’t wait for this phase to end! I would love to hear how he responds to these. The picky stage is so not fun! Seriously so easy–My kids would love these too. Thanks for sharing! Have you tried to freeze these and reheat them? Like for quick breakfast or snack? I haven’t, but I plan on trying it soon. I’ll report back when I try it! Did you ever freezer these? Yes and it works well! Im vegan. Is there a substitute for eggs in this recipe? It looks great! I’m also interested in a vegan option…did you ever try the follow-ups you mentioned above? I tried making these with oil to replace the egg, like I do in a lot of recipes when I veganize them but that did not work. They turned out more like fried sweet potato and nothing like the fluffy looking pancakes in the pictures. Thanks for reporting back. I figured that they wouldn’t work well without the egg. Eggs are basically the “glue” that hold the two ingredients together. I’m sorry, I really can’t say since I have never tried that egg replacer. Please let me know if you give it a try and let everyone know how it turned out! Gelatin eggs didn’t work for me. Thanks for letting us all know, Judy. I would try banana to replace the egg. 1 banana/egg. I’ve made cookies like that before and they turned out awesome. I have done it that way as well! 🙂 My husband doesn’t like bananas, so this one is better for him. Love! This! Have you tried this with banana instead of SP? Also yum! I bet a combo banana/SP would be good too! I’m tryin’ it! I make these at least once a week and I’ve never had a fail. Can you give me more information about what went wrong and maybe I can help you troubleshoot. Sorry it didn’t work for you! I just tried these for the first time today, using up some sweet potatoes that were one step away from the compost heap. What a wonderful suprise! I did the mixing in my Vitamix, resulting in a wonderfully light and airy texture. My husband had three helpings, and was unexpectedly enthusiastic. I’d been off flour and sugar for so long that this breakfast felt like a real treat. Thanks very much for the easy recipe! What amount did you use in the Vitamix? Did you have to double the recipe? I’ve tried small amounts and it doesn’t typically mix well no matter how much scraping I do. So I wanted to get I out before trying. Thanks. Thank you! It worked beautifully. My toddler devoured them! Have you ever tried this recipe with box pumpkin? BTW I tried to rate this recipe 5 stars but it would only go up to 3 so I skipped it. I’m glad to hear your toddler liked these! 🙂 I have tried it with canned pumpkin and didn’t like it as well. The texture is different. Thanks for letting me know about the rating; I’ll check it out. 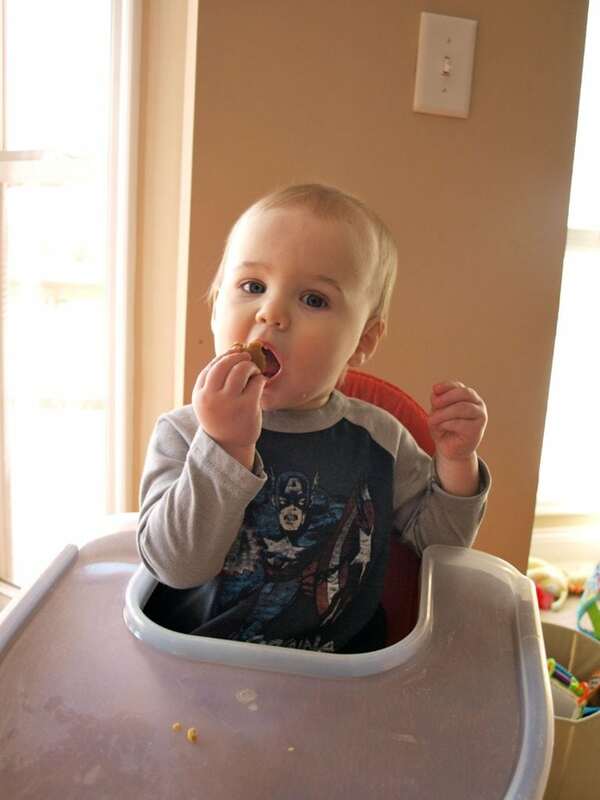 I wish I could show you a picture of Jackson looooving his sweet potato pancakes! He is picking them up so happily and loving each bite! No joke!… I think both mommy and baby have a favorite new recipe! Awww so cute! 🙂 So glad he liked these. And you, too! Thanks for this simple but baby-loving recipe! I made it today (for the second time in one week!) with purple yams and they were so fun looking! The purple yams weren’t quite as sweet (but have a great texture! ), so I added a little applesauce to sweeten a tiny bit, and a dash of cornmeal to make up for the applesace 😉 They were great and my 1 year old ate almost all of them in one afternoon. They are such a great travel food, and I also find them helpful to take to restaurants since they are similar enough to bread that they appease her while the rest of us chow down on dairy and gluten-laden foods that she can’t have. Thanks! As I read this comment, I couldn’t help but wonder if this could replace bread/bun for a ham and Swiss sandwich…I’m definitely going to try this! More notes, after making another 2 batches of these 🙂 For those that have had problems with them not turning out well: 2 considerations– 1)I’ve noticed that I must let them sit 3 minutes per side before I attempt to flip them (I actually set the timer)…I did a batch that I got a little impatient on, and flipped too soon and they just started to fall apart from there. Still edible but not pancakes! 2) I’ve noticed that yams produce a more eggy pancake, whereas sweet potatoes are a little starchier and seem to produce a more pancake-like texture. So if you have had trouble you might try that…also beat them really well. Thank you for sharing your notes! Great point about trying to turn them too soon. I’ve since learned that that can be disasterous! I didn’t realize the different potato types made a difference–thanks so much for that insight. I made these for my 17 month old son, and he absolutely loved them! I am making a second batch right now…thank you for sharing this! I love ukur recipe. I will tegur definetily. These had great flavor, but mine only made four 1/4 cup pancakes. Not sure how you got 12 out of that batter! haha. Anyway, they were delicious and we had a side of eggs and fruit with them. I use a tablespoon not 1/4 cup. 🙂 So they are little mini pancakes. Glad you liked them! What about adding some coconut flour? We are always rushing in the morning, Can I prepare them ahead of time and just cook them in the morning? Yes, I have done that! I just made these and they turned out…well…not looking like pancakes or cakes at all. Did you use flour? No, no flour at all! I make these all the time, and mine look like little pancakes. Once you eat them, the texture isn’t the same as pancakes, but they definitely have the appearance of pancakes. How big did you make yours? The recipe says to use a tablespoon size amount of batter. If you make them too big, you could have a problem. What did yours look like? If you don’t cook them long enough they will also look different because they tend to fall apart when they are bigger. I’d love to help you troubleshoot because this is one of our favorite recipes. Maybe if you can give me a little more info I can try to figure out what went wrong! Sorry they didn’t turn out as you’d hoped. Hi, do these come out like soggy? I’ve made many already and they’re like, wet. They don’t seem to dry up. They look like pancakes, but very wet from the inside. When you say the texture is different when you eat them, is that what you mean? Is this how they are and I just have to get used to that? No, they should not be soggy at all. You may need to turn down the heat so that they cook all the way through. The texture is different from a pancake, but not soggy. I’m sorry but I haven’t tried this without the eggs! My inclination is to say no it won’t work because the eggs not only hold it together but give it the texture, without it I’m afraid it would be very different. Normally I replace eggs with a “flax egg” (1 Tbs flaxseed meal+3 Tbs water= 1 egg), but I don’t know that it would work here. Please let me know if you try it though! I have two questions before I make these. Could you use egg beaters and/or whites? You stated that they look like pancakes, but don’t taste exactly like them. Does this mean they have that overly spongy egg taste and consistency? This happens quite often when I am baking GF muffins/baked goods. I do think egg beaters or egg whites would work; just use the equivalent amount. The texture is a bit egg-y. Since there’s no flour, you don’t get that fluffy, crumb texture. But when I make these I just call them pancakes and don’t differentiate between when I make regular pancakes, and my kids love them both. They don’t ever ask “what’s weird about the pancakes?” or anything like that. 🙂 If you are looking for something that is exactly like a pancake, this isn’t it. But if you are looking for a fun and healthy alternative to pancakes, you got it right here! I hope you enjoy these if you decide to try them. I just made these tonight and my 21 month old son gobbled them up while saying “MMMmmm” the whole time! 🙂 Thank you! (I found you on Pinterest) …oh I used all the seasonings you suggested! Yummy! Especially topped with pure maple syrup! Have you tried them as waffles or substituting pumpkin? Also can they be frozen ? I have tried substituting pumpkin, but didn’t have the best luck. They didn’t hold together well. I haven’t tried these as waffles though! i made these tonight and they look nothing like your photo. The taste was fine but how can I get them to look more like pancakes. Would blending them work better. Is the mix supposed to be a batter. Mine was more choppy. By the way I cooked the sweet potato in my crock pot on high for 4 hours and the skin just peeled right off. Very easy. Thanks. Yes, you can blend them to make the batter super smooth. I have done that at times, but don’t do it every time. Yes, the mixture should look like a batter. If your doesn’t, you may not have mashed your sweet potato enough. Try the blender–sounds like the super smooth result is what you’re looking for! Yes, you have to measure the sweet potato. Getting the ratio right is important. Too much sweet potato and not enough egg and it wouldn’t hold together well. The only time I have difficulty flipping is when I don’t let it cook enough and try to flip it when it’s still raw. I hope you give these another try because they really are great! hello thanks for the recipe i looks so good… i have a question can i put banana instead of egss?? I have not tried this without eggs, so I’m not sure if a banana substitute would work. Please let me know if you give it a try! This recipe is enough for my one year old, but don’t plan to share! She loved these. We subbed 2 flax eggs for the real eggs, added 1/2 cup sorghum flour and 1 1/2 t baking powder trying to get a lighter pancake. They were pretty thin, but cooked to a nice crisp on the edges. In our dairy, gluten, egg free household, these worked and were a hit! Thanks for letting me know they worked with flax eggs! I made these this morning, sort of. I was looking for a low carb (high protein) breakfast option and thought this was a good starting point. I used 1/2c Pumpkin Puree & 2 Eggs. Then I added a bunch of other stuff, but kept them gluten free. They were more for me, and well I just need more “something”. So. I’m not much of a cook, but I was surprised I managed to make pancakes out of the mess I concocted. I was aiming for a pumpkin pie sort of thing that I could eat with out syrup. I added 1t pumpkin pie spice, 1T coconut sugar, 1 T white sugar, 1t Baking powder, 2T unsweetened coconut flakes, 2T GF Oats and 1T Chia. I put all the dry things into my baby bullet with the mill blade and made a “flour” and mixed that with the wet. Dropped them by 1/8c scoops into a hot coconut oiled pan. Cooked them on med-low (I forget how long). They were kinda eggy, but certainly pancakes. I topped them with whipped cream and ate the whole batch for about 500 cals. 17g of Protein. You probably could leave the sugar out (or add a banana instead) but I like sweet things for breakfast. They weren’t real sweet. Anyhow. So it worked and they’re still gluten free and healthy. Thanks for sharing how you adapted this! I didn’t have luck with pumpkin at all, but didn’t add anything else. I suspect a little more is needed to hold them together with the pumpkin. I love yams! These are being added immediately. Great! We love these so much! I just tried this and failed epically in getting them to stick together and flipping them. Now I have read through the comments and I admit it I did not measure the sweet potato. So according to a conversion page one Cup SP equals 328g. Half of it 164g. Is the correct amount? I hate to admit this, but I’m not very familiar with grams. I’d just google it to get the answer…so your answer is probably correct. 😉 Whatever is equal is 1/2 cup is correct. You’re welcome! I hope you enjoy these! I am trying these this weekend! Thank you for the recipe! I just made these coming back from Crossfit this morning and they are on point! I still have my protein (from the eggs) and my carbs, and I added some fat (almond butter) on top. I put all the ingredients in my VitaMix and managed to get 4 little pancakes (all for myself) out of it. They taste like autumn! The allspice and ginger bring back that pumpkin flavour and they are perfect! Thanks for sharing these! Could I link to them on my blog with trackbacks? Thanks! Hi Val, you are welcome to link to my recipe. I love these with almond butter on top, also! I am a bit confused…underneath the recipe description it says dairy-free but this recipe calls for eggs? ?. Eggs are not considered dairy. Dairy is cow’s milk or anything made from cow’s milk, such as butter, cream, yogurt, etc. Hi…on the westcoast of Canada we call the orange flesh tuber yams and the white fleshed starchier tuber, sweet potatoes. On the east coast of Canada in Nfld, it’s reversed. Which one are you referring to in your recipe? I have used both in these. these were so easy to make. i didn’t even use a blender- just mixed it up in a bowl. mine ended up burning due to taking two phone calls while cooking them but they reminded me of pumpkin pie!! I’ve never tried it, but if I do I’ll let you know! I’m pretty curious now, so maybe I’ll have to try it soon. 🙂 I don’t know if it would hold together as well, but it might just work. I’ll report back if/when I give it a go! Used a sweet potato, apple & carrot stage 3 gerber I had on hand, an egg and a touch of self-rising flour. These were a hit and this mama who doesn’t cook was too! Do the sweet potatoes need to be cooked and mashed first? Yes, they must be cooked, mashed, and then measured to 1/2 cup. Can you make them as waffles? How long can you store them in the refrigerator or freezer? I don’t think these would work as a waffle. They will last in the fridge for a few days, a few months in the freezer. Would it work to add a bit of coconut flour to this for flavor? Since this recipe makes 12 pancakes total, how many pancakes are considered a serving? These are very small, mini pancakes. This serves 1-2 people. Thanks Maryea! So for further clarification, these would be what they call silver dollar pancakes, yes? Thanks for the recipe. Am I right in assuming that the sweet potato has to be cooked first before mashing it with the egg to make the batter? Yes, the sweet potato needs to be cooked first. Enjoy! I am Vegan and was wondering if you have tried using something other than the egg for this recipe? I have not. If I try it I will definitely let you know! Thanks so much for posting this! My 7 month LO is quite the little foodie and has taken to solids and thick, lumpy purées of family foods like a duck to water, but has not been interested in finger foods at all, despite trying them regularly… Until I made him these! He’s a huge fan of sweet potato, so I was hoping he’d like them, but his love for them far surpassed my expectations. So nice to see him happily having finger foods instead of trying a bite and dropping the rest on the floor bit by bit. Thanks! I would love to try these but with out the eggs…are there any egg substitutes that work well with this recipe? I have never tried anything, but I think aquafaba may work (the water from a can of chickpeas). I’ve been meaning to try it since I get this question a lot. If I do, I’ll definitely let you know! What do you mean by “please no more recipes” ? Are you asking me to stop publishing my recipes online? I have posted hundreds of recipes on this blog with so much positive feedback. This is my job. I’m not sure if you were thinking when you typed that comment. This is a tricky recipe, to be sure, but I have gotten so many positive reviews about this recipe. I myself have made it countless times. I appreciate an honest review and am sorry this frustrated you, but please remember that I am a person and general decency is expected when commenting. Can’t wait to try these! Wondering if a ripe banana might be good added in? Hi there, I’m curious if the pancakes could be make with egg whites. Hi Marcie, I haven’t tried it so I can’t say for sure, but I feel like it would work. If you do try it, would you please let me know how it goes? Thanks! Hi, where I live, sweet potatoes are the drier, usually lighter coloured ones and yams are the ones that are quite orange and more watery when cooked. So when you call for sweet potatoes in your recipe, would it be the yams? The colour of the pancakes makes me think it is what we, here, call yams. These are fantastic. I made them when I had almost no food in the house after returning from a trip, but was lucky to have a large sweet potato and a few eggs. I used a little more sweet potato than it states in the recipe based on the consistency after blending. You’re welcome! Glad you liked these! My son loved these! I searched for a sweet potato pancake recipe this morning to use up some baby food and they turned out perfectly. Thank you for sharing! I’m glad to hear that, Gillian! Thanks for the feedback. these are awesome thank you thank you! they never broke for me! Hi! This sounds wonderful! Since you mentioned that the proportion of eggs to sweet potato is crucial, could you tell me the measure of sweet potato in ml rather than cup measure? Can’t wait to try these. I’ve not tried regular potatoes with these. I do think it would work, but the flavor wouldn’t be the same. The sweet potatoes make these sweet, where that element would be missing with regular potatoes. What would you recommend as a vegan substitute for the egg? I have heard of chia, flax, or even aquafaba. What would the measurements be with an egg re-placer? Can the eggs be substituted with applesauce? My little guy is allergic to eggs! I’m not sure if it would hold together enough with just applesauce and sweet potato. If you try it, I’d make sure to make very small pancakes so they are easier to flip! Hello! 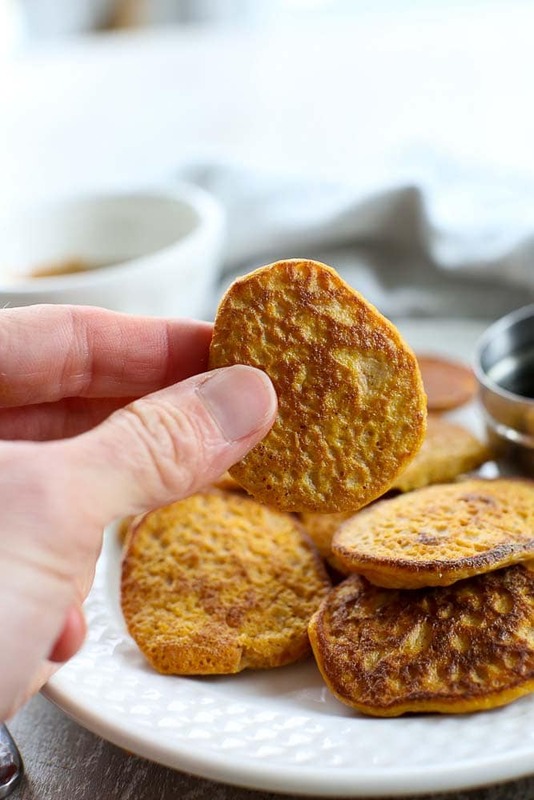 Do you make these with baked sweet potato or boiled sweet potato? I used boiled but think baked would be better texture and easier to cook. Please advise! Loved them as boiled, though! Delish. I just made these this morning. I was so hungry for sweet potatoes. I had some leftover and found your recipe. I am on weight watchers so this was perfect. I just mixed the sweet potatoes and eggs with a fork and then cooked them at 300 degrees for 3 minutes each side. They came out perfect. It made enough for 8 pancakes for only 4 points! So happy to hear this Susan! Thanks for the feedback! Such a nice idea for adding the ginger into the mix! The smell would be more flavoured. I know a lot of people asked if these can be frozen and you confirmed it works ok but (this may be a dumb question), will they get soggy as they thaw out? Did you heat it again in the oven or microwave? I was hoping to just thaw it and serve cold since my sons daycare isn’t able to heat up their lunches. Thanks! I usually reheat in the microwave. Not sure how they are cold, sorry. These are so good! Simple and perfect for healthy lifestyles and working out. My new “go to” muscle fueling meal! I have never commented on a blog before, but had to for this recipe! I added 1/4 tsp of pumpkin pie spice, which was perfect for the size of each batch. They even cook like real pancakes…flip when bubble holes form and edges are slightly dry. This one is a keeper! Can you prepare these pancakes using egg whites instead of whole eggs? My sweetie is on a restricted diet with no egg yolks allowed. I have not tried it, but I think it would work. Try 3 egg whites. Thank You – will try it out this weekend. This past month I gave up sugar and carbs like bread and wheat. I missed pancakes so much and I stumbled across this recipe. Seriously amazing. So so yummy and all three of my kids ate them up. I’ve shared your website with everyone I know. Thank you!! I’ve made these twice so far for my 1.5 yo daughter. They are a huge hit. I add a little salt, nutmeg, cinnamon and couple tsp of maple syrup and blend all together. Thanks so much for the recipe! The best recipe ever. I used organic canned pumpkin puree, eggs, pumpkin pie spice, vanilla, and added coconut sugar. Amazing. I drizzled with natural peanut butter, a tiny bit of honey, and sliced banana and a little cinnamon on top. Seriously amazing. So happy i came across this recipe!! Thank you!!! Oops i mean i used canned sweet potato purée! How long can you freeze these pancakes for? They are good in the freezer for 2 months. Amazing recipe! So happy I came upon it and tried it!! Pinned! I discovered this post only yesterday. I see you’ve thought about Sweet Potato Pancakes earlier than us. But I don’t expect you to end your discussion on the specific matter so soon. Can’t you please share more of your insights into it. Really, our neighbor groups who visit our website- Spottingpro oftentimes would be happy. Thanks a lot, Maryea! Oh, This potato recipes looking so yummy and crispy. I’ll share this recipe with my wife. Quick question, can I put the batter in the fridge and use it next day?